wooldancer: a little shop corner GIVE AWAY! a little shop corner GIVE AWAY! a little shop corner in my studio, originally uploaded by wooldancer. this is what i see when i walk into my little garden hut-turned studio. it's lovely to see all the colourful fibres there, awaiting transformation. I have been spinning these organic merino fibres into some simple yet sublime handspun singles yarns.. so smooshy & yummy and scooped off the shelf as soon as they are spun. 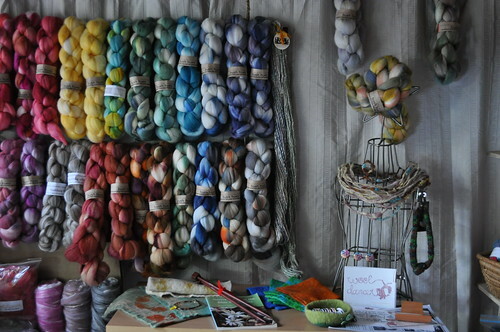 I am so grateful to all my fibre friends who visit my market booth to snuzzle in & make something with my fibres.. I'm excited to think of what they become. 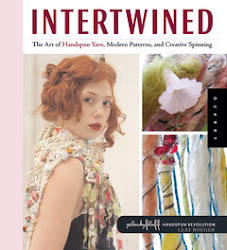 Have you made yarn or felt with wooldancer fibre? Comment with a link, or email me a pic to: info at wooldancer.com, share your creations with everyone, and win a chance to scoop up a free handdyed braid ! Comments will be open for one week, & then Mr random generator will draw a winner ;) squee!